Valerie grew up in the United States, outside of Boston. She did her undergraduate degree at Harvard where she studied Statistics. Her senior thesis, "Redesigning the Harvard University Health Services' Freshman Well-being Survey" won a Thomas T. Hoopes prize for outstanding scholarly work or research. After graduating, Valerie moved to Washington, D.C., where she consulted on polling, predictive analytics and outreach optimization for a wide variety of governments, non-profit entities, for-profit companies, and, primarily, for Democratic political campaigns. Valerie is interested in machine learning, causal inference and survey methodology with applications in the social sciences. In her free time, Valerie enjoys biking, cooking and exploring new places. Alan is from Hong Kong. He graduated from the MMath Mathematics and Statistics with a distinction from the University of Oxford. His thesis, "Modelling Heterogeneous Disease Trajectories with Infinite Mixture of Gaussian Processes" explores the use of a mixture of Gaussian Processes to model heterogeneous times series. Currently, he is very interested in Machine Learning and its use in structural discovery. Outside of studies, he enjoys coding, reading and singing. Emmanuelle comes from Accra, Ghana. She had her undergraduate degree at the University of Ghana where she studied Mathematics and Statistics, majoring in the former. Her final undergraduate project was entitled “Mathematical Models for Malaria in the Human and Mosquito Populations” and she was named the best graduating female student in Mathematics and Statistics. After her degree, she worked for a year as a Teaching Assistant in the University of Statistics of the University of Ghana. 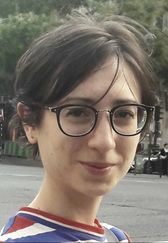 Emmanuelle’s research interests lie in the area of applied statistics and statistical modelling (with particular applications in epidemiology). Aside statistics, Emmanuelle is passionate about teaching and environmental sustainability and she is the co-founder and team leader of a vibrant recycling promotion NGO based in Ghana. Natalia comes from Spain. She moved to Scotland in 2014 to study Mathematics and Statistics at the University of Glasgow. Her dissertation explored Epidemic Modelling on Complex Networks through agent based simulations. Last summer, she completed a research project in Survival Analysis where she investigated End Stage Renal Disease in children across Scotland using Electronic Health Records data, during which she grew a special interest in Medical Statistics. At Oxford, she aims to apply and develop Machine Learning and Bayesian methods for genomic data and precision medicine and will be collaborating closely with CRUK Oxford Centre. In her spare time, she enjoys singing, dancing and swimming. Bobby was born and raised in Durham before moving to Oxford during his time at secondary school. He spent four years at Cambridge studying for his master’s in Maths, where he focussed on Statistics and Probability in his final year. Bobby’s Part III essay discussed developments in Generative Adversarial Network algorithms and he is looking forward to studying similarly fascinating problems throughout his DPhil. During the summers of his undergraduate degree, Bobby has undertaken a research project in infectious disease dynamics at Oxford and interned at a sports modelling company based in Exeter. When not moving between ancient university towns in England, Bobby likes to travel, play the violin and play various sports. Ana studied Mathematics at Trinity College Dublin as an undergrad, and went on to obtain an MSc in Statistics and Operational Research at the University of Edinburgh. Her MSc dissertation focussed on using Bayesian analysis with MCMC methods to fit point process models to volcanic earthquake data, with part of the project focussing on estimating eruption time. Ana remains interested in computational methods for Bayesian statistics. In her spare time, Ana enjoys figure skating and drinking wine (not at the same time). Yuxi is originally from China, and has been in the UK since 2007. She completed her integrated Masters Degree in MORSE (Mathematics, Operational Research, Statistics and Economics) at the University of Warwick. Her dissertation looked at the relationship between neuroimaging data and the progression of clinical states in Alzheimer’s Disease, which involved modelling data using a shared random effects model that allowed the joint analysis of a longitudinal and a Markov multi-state process. Yuxi is particularly interested in statistical modelling and large-scale data analysis, she also has a growing interest in Bayesian statistics. In her free time, Yuxi enjoys reading, travelling and listening to music. Maud grew up in the north of France and lived in Paris to study theoretical Mathematics and Physics in Preparatory Classes at Lycée Louis-le-Grand. She subsequently completed her MSc of Engineering at TELECOM Bretagne, where she developed an interest in Statistical Data Science. For the last year of her degree, Maud moved to the UK to follow an MSc in Machine Learning at Imperial College London. For her MSc dissertation, Maud worked on knowledge representation and reasoning and she pursued research in this field by working 6 months at Samsung R&D UK with a special focus on processing very large amounts of data. In her spare time, Maud enjoys running, swimming, and playing the piano. Hector grew up in Dulwich, South London. He studied for an Integrated Master’s honours degree in Mathematics at Durham University, where in later years he focused more on modules relating to applied Mathematics and Statistics. His Dissertation was entitled: “Modelling Epilepsy using Bayesian Methods for Hidden Markov Models”. The project began by looking at the standard methods for analysing Hidden Markov Models (HMMs) then moved on to cover the use of data augmentation and Gibbs sampling to provide a more comprehensive analysis. At the CDT, he would like to learn more about computational statistics, stochastic simulation and latent variable models. During his spare time Hector enjoys travelling, learning French and playing sport. Lorenzo grew up near Torino, Italy, where he obtained his Bachelor degree in Physical Engineering. Afterwards, he started an International Master in Physics of Complex Systems, an interdisciplinary course that brought him to study and live in Trieste, Torino and Paris. Throughout the Master, he developed an interest in the mathematical principles of the statistical techniques used in physics, rather than the resulting description of the physical phenomena. He decided therefore to apply to the OxWaSP program to broaden his knowledge of Statistics. He is right now interested in applications to machine learning, domain in which his Master thesis was inserted, but he is eager to discover new fields during the CDT. In free time, he enjoys doing sport, reading and playing the guitar. Deborah comes from France, where she grew up and obtained an Engineering Degree at Ecole Polytechnique (Paris) in 2018. In her final year, she specialized in Applied Mathematics, and became particularly interested in stochastic processes and theoretical subjects in Machine Learning. Deborah’s master project was on Geometric Deep Learning, with an application to graphs of molecules and prediction of their quantum properties. Her research interests also lie in optimization landscapes in machine learning and statistical models on graphs. In her spare time, Deborah plays the violin and loves to play in orchestras and chamber music groups. William studied his MMath in Mathematics at the University of Bath, choosing to specialise in statistics. In his third year, he undertook a study year abroad at Dalhousie University in Canada, before completing a summer internship at the Office for National Statistics. This internship raised his awareness of the roles machine learning and big data can play in government and industry, inspiring his final year project, ‘Classification for Large Data’, which explored the theory and application of various classification methods. His research interests currently lie in machine learning and time series analysis, but he is open to exploring different topics during his time at OxWaSP. Outside of his studies, William enjoys cooking, live music and playing chess. Prior to joining OxWaSP, James worked in a modelling, data, and analytics role at a large investment management firm in London. James completed the Masters in Mathematics, Operational Research, Statistics and Economics (MMORSE) degree at Warwick in 2016, specialising in Statistics with Mathematics. James' master’s dissertation was entitled “Markov Chain Monte Carlo for Bayesian Non-Parametric Mixture Models”, supervised by Dr Anthony Lee. As an extension to the dissertation title, James also explored applications in supervised learning and in topic modelling of social media data. James remains interested in scalable Monte Carlo methodologies, Bayesian Non-Parametric models and ‘machine learning’ from a probabilistic perspective.